Water consumption for the extraction of bitumen in the steam assisted gravity drainage (SAGD) process will most likely become a limiting factor for the growth of oil sands industry. A significant amount of research and development is currently underway in the Canadian oil sands industry to improve water treatment processes to allow for higher rates of water recycling as well as reduced energy consumption. In a typical SAGD surface treatment plant, the produced emulsion is first sent through a series of gravity separation vessels to remove the gases, and separate the bitumen and water. The de-oiled water then mixes with make-up water and recycled boiler blow-down (BBD) and is sent to a warm lime softener (WLS) and ion exchangers (IX) to remove silica and Ca2+ and Mg2+. The treated water is then used as boiler feed water for a ‘once through’ steam generator (OTSG), which can tolerate relatively high amounts of TDS and TOC. However, OTSGs typically produce only low quality steam (75-80%), resulting in a large volume of boiler blowdown (BBD). A portion of the BBD is recycled back to the WLS and the rest is sent to disposal. The conventional WLS-IX water treatment configuration does not reduce the amount of dissolved organic matter (DOM) or salinity (TDS) in the boiler feed water. The high levels of DOM and TDS in the OTSG feed water can cause operational problems including fouling of pipelines and equipment, and clogging of injection wells. To reduce the volume of disposal water, evaporators are sometimes used as a downstream BBD recovery process. Evaporators have also been used to directly desalinate produced water to make high-quality boiler feed water, but this requires large amounts of energy. High boiler feed water TDS and DOM results in higher blowdown volumes and necessitates recycling more low quality BBD water. By contrast, membrane-based processes can separate almost all silica and divalent ions and reject more than 90% of DOM and TDS in a single step operation. In addition to improving the operation of OTSGs, a membrane-based desalination process would allow the production of high-quality BFW suitable for higher efficiency drum boilers, while consuming less energy than if desalination evaporators were used. Membrane separation processes have become one of the fastest emerging technologies for desalination and water treatment due to their lower operating costs, compact design, and high product quality. 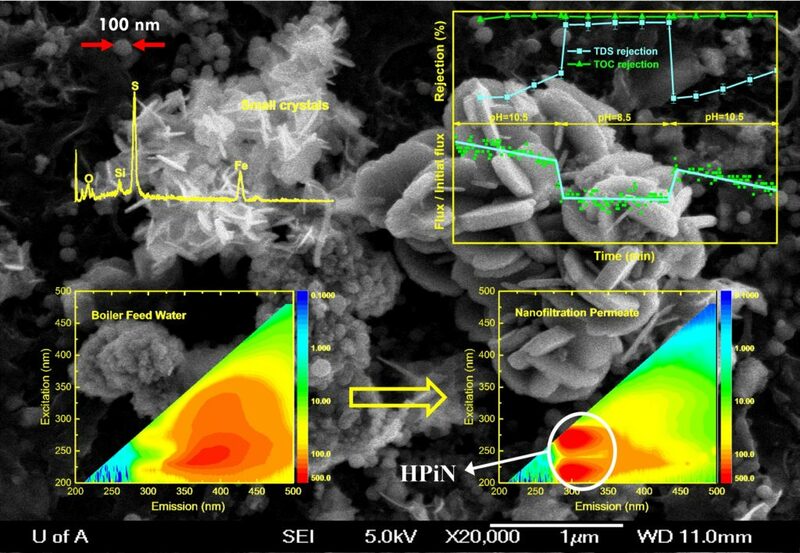 However, low thermal stability of commercial polymeric membranes and their susceptibility to fouling has limited the development of sustainable and energy efficient membrane processes for the SAGD process. The development of high performance polymeric membranes in terms of fouling and thermal resistance has therefore become one of the main focus areas of research in the AWRL. AWRL can contribute a proof of concept of membrane processes for SAGD water treatment to oil sands industries.